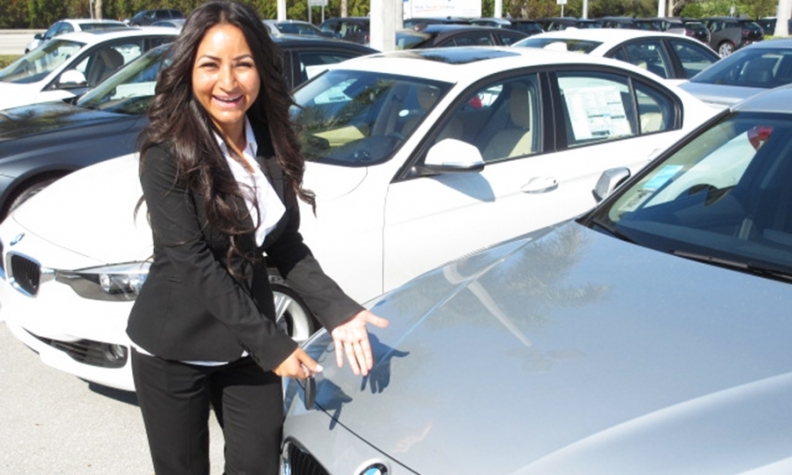 When Tahmina Hassanein, a BMW saleswoman in Fort Myers, Fla., meets a potential client, she approaches the encounter as a branding opportunity -- and not just for BMW. The chance to leave a lasting impression on a potential buyer perusing the dealer lot doesn’t have to end when a salesperson hands over a business card. That should only be the start nowadays -- especially in the age of social media, where salespeople can showcase their personalities and product knowledge through videos and candid photos. Social media allows salespeople to add a personal touch, which is crucial to building trust among clients in a business that hasn’t always had a warm reputation among the public. New light of freedom in your two-way power glass window BMW 5 series. Contact Tahmina and experience another world of freedom when you order your BMW 528i. Hassanein, who made the jump from finance to sales last year, directs people to her Facebook fan page, where she does video walkarounds and strikes poses for photos highlighting certain vehicle features. Potential clients also can read reviews from past customers to get a better sense of who she is. In addition to pitching cars on her page, Hassanein sometimes promotes BMW accessories, such as coffee mugs and watches, even though she doesn’t get commission. Although she works in Florida, she’s sold accessories to people in Texas after building connections through her page. Hawking accessories is just a chance for her personality to shine through. She considers social media a valuable tool in the sales process, even if some doubt its effectiveness. “It’s how you personally approach it and personally convey the message using the social media,” said Hassanein, who recently began working for BMW of Fort Myers after a stint at a BMW store in Naples. Hassanein didn’t launch her Facebook page as soon as she started her sales career. She waited several months to build up her product knowledge first. Hassanein’s Facebook page has nearly 500 fans so far. She’s working on building her Twitter following, too.